Up until now it has been a mild winter. This has resulted in a lot of plants starting to bud earlier than expected. Nature is really quite confused! One thing that is for sure, we can expect the vanguards of the new season to emerge during January. Not only do we have the welcoming snowdrops starting to come into flower, but also the wonderful diminutive and structural Eranthis hyemalis. Their deep buttercup yellow blooms sit daintily on a ruff of rich green foliage and are striking against the dull woodland surroundings or any snow that may fall at this time of year. 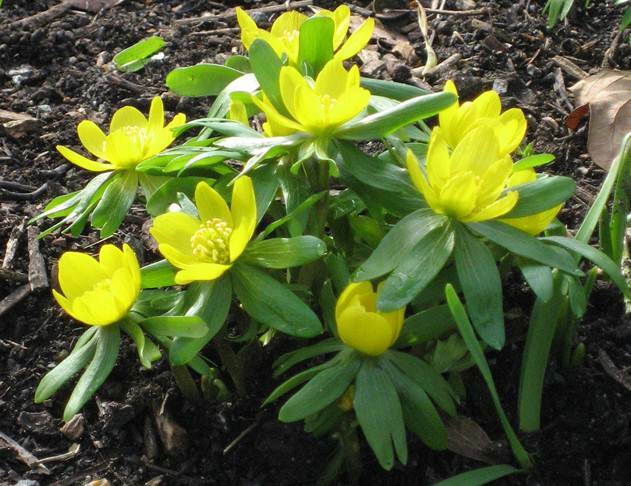 Commonly known as the winter aconite, these flowers look great in woodland environments, especially if planted amongst cyclamen. They are also a useful plant for rockeries and alpine beds and gravel gardens. The tubers can be lifted just after flowering and located in suitably naturalised areas. They sometimes are difficult to get established but once they are happy, they enthusiastically spread by casting seed. They prefer shade and are quite impervious to extreme cold, pushing up through frozen ground and snow. A later flowering version is available, Eranthis x tubergenii ‘Guinea Gold’ with brighter flowers and taller stems. Eranthis hyemalis is a member of the buttercup family hence the colour and shape of the flowers.